I suspect that the majority of the attendees at this week's Congress do not use Social Media. There was, however, a small group of active Tweeters and Bloggers who shared news and opinions about Congress happenings via Social Media. Sharing our experiences in real time via social media enhanced our enjoyment of the Conference. As the Official Blogger for the Conference I tried to encourage others to blog and tweet and endeavoured to so so myself. Some of us had not previously met in person but we came together as good friends because of the communication we have had via various social media over the last couple of years. Over the the next few days I will compile and publish a list of links to all the posts written about Congress. It will be a valuable archive of reports for the future. Thank you to the bloggers who joined with me to wear gaudy blogger beads during Congress. I was pleased when Alona Tester from Gould suggested that the Geneabloggers at Congress gather for a group photo today.Thanks to Mr Geniaus who came over to the Convention Centre today to act as photographer. Together with about half the Congress Attendees I donned my gladrags last night for the Conference Dinner in The Adelaide Convention Centre. Shauna Hicks, who spoke at the Congress, was the Hostess of my table. We were joined by Michelle Nichols and Jonathan Auld from Ebenezer, NSW, Seonaid Harvey from New Zealand, a lady from Penrith, NSW, a couple from Brisbane and a couple from Blaxland in the Blue Mountains. Five of the six people who were tweeeting from the dinner were seated at out table; the other Tweeeter, Liz Pidgeon was a few tables away. We had great fun talking, laughing, tweeting and posting cheeky messages about the evening. The entertainment for the evening, a bush dance ensemble was a bit corny but was enjoyed by many, our mate Seonaid joined in the fun when members of the audience were invited to take part. 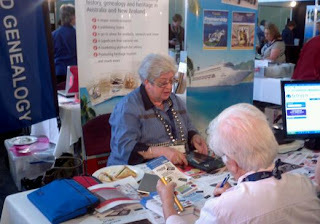 June Penny from the ACT was a very popular the recipient of the AFFHO award for meritorious service to family history. Familysearch representative, Dan Poffenberger who fancies himself as a comedian, was the after dinner speaker giving a humorous presentation looking at quirky entries from parish registers and other documents. As usual my camera came out of my handbag to record images of the evening. I have been so busy talking and networking at Congress that I have been neglecting my camera. Hopefully it will get a good workout at The Congress Dinner that is to be held this evening in The Convention Centre. Following is a small collection of mugshots that I took today and yesterday. I have been a fan of the Flip-Pal mobile scanner since I purchased mine at Rootstech 2011. Many of my Australian friends in genealogy have been quite envious of my little Pal and have lusted after one for themselves. The good news is that they are now available for order in Australia from Gould Genealogy. Alan Phillips asked me if I would help out on the Gould stand at Congress today and tomorrow with demonstrations of the device. I had great fun at morning tea and lunch putting Gould's demo Flip-Pal through its paces. I didn't have to do any selling - these little devices sell themselves. Thanks to Michelle Nichols who took this snap of Geniaus playing salesperson and emailed it to me. I'll be back on the Gould stand during the breaks tomorrow (Saturday) so, if you are around, please come and say hello and I'll put the Flip-Pal through its paces for you. This evening the Lord Mayor of Adelaide (in absentia) hosted a Civic Reception for a number of delegates, speakers and sponsors at the Adelaide Congress. As the Official Conference blogger I was lucky enough to be included in the group invited to this function in the historic Queen Adelaide Room in the Adelaide Town Hall. On arrival guests were greeted by Deputy Lord Mayor, David Plumridge. Following is my second set of photos from the event. Blogger Bling - Geneabloggers - Are you Ready? What is a Kiva loan?